« How Long Will the Basin in Badwater be Flooded? 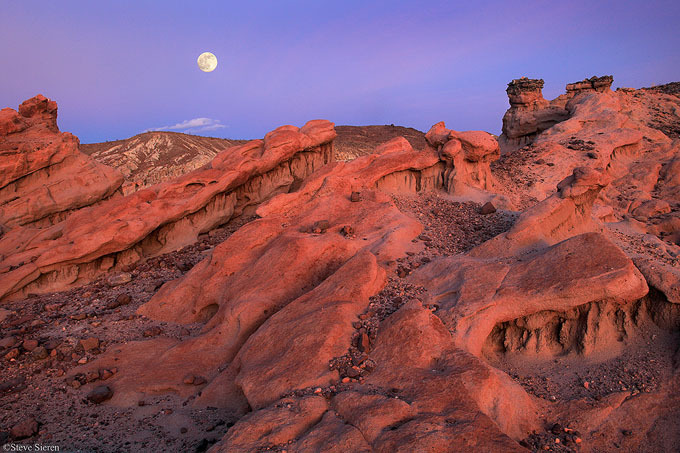 A scene more common to the deserts of Utah and Arizona can be found right here in the Mojave Desert of California. It just might take a lot more seaching to find something you like since there are no iconic "stand here" spots so it’s best to just wander and create your own stand here spot. Then you can always return when you like with no worries about the crowd. This is one of the goals in life so I can hopefully leave something behind besides just pretty photographs. With so much nature out there do we need these so called stand here spots where it doesn’t change much a few yards over to the left or right? It’s been 25 days since my last so called iconic visit, I’m going to see how long this will last. I think I can do 100 days piece of cake. This entry was posted on February 25, 2010 at 3:02 pm and is filed under Uncategorized. You can follow any responses to this entry through the RSS 2.0 feed. You can leave a response, or trackback from your own site. With scenes like this, who needs icons! Great find and even better execution of an original and impressive image! 100 days, eh? Thanks David, I’m taking bets! Should be a lot tougher to create but I feel I’ve gotten pretty used to it by now. I did shoot at Badwater when it was a lake a couple of days ago but that was just a self portrait assignment for some company advertising. All my EXIF info will show on flickr so it will be trackable. I’m curious to how this might affect my own drive. I completely agree with your view on “stand here” spots. I don’t mind photographing them so that I can at least remember my visit there but I’m putting my feet or tripod right where countless others have. That’s kind of the nice thing about Idaho…there aren’t too many iconic places. Over three months of no iconic shots does sound difficult…good luck with it! Aaron, Idaho, I’ve always wanted to visit Craters of the Moon! I can’t think of one iconic place there. What are the iconic places out there? Sounds like a challenging place Aaron. There are a couple lakes in the Sawooth National Rec. Area that see tons of campers/hikers and visitors during the summer. Shoshone Falls is also in Idaho (one of the biggest waterfalls by volume in the U.S.). It is rather surprising that the closest we have to a Nat’l Park is Craters of the Moon Nat’l Monument and City of Rocks National Reserve. It does make it easier to compose originally. Aaron, there was an article a while back in Backpacker on the Sawtooths, looked like a great place to BP. Michael, I have a feeling you know where most of the stuff I come across out there in the Mojave is. One of your best, Steve. Love the angles in the rock…beautiful. Beautiful photograph, or as Dad would say with his wry smile, “Nice snap.” The icons are all beaten to death now anyway. The future of what any of the museums or even galleries, the good ones, believe it or not, will want is stuff they’ve never seen before. That’s why everyone is taking trips to South America. Bah Humbug. Who needs South America? Edward Weston used to say he could look at his shoe and find a great photograph. Richard, I did think of that possibility and luckily with more wildflowers it should open up more possiblities in some of the other locations. I guess this could a very limiting task but I’m just going to limit down to where the tripod potholes are. David, I’m in Weston’s boat, the area around the so called iconic places is just too vast to be empty. There just has to be so much more out there! I need to keep the travel time down to a minimum do to time constraints. Never really thought about the museums wanting more work from the unknown but it does seem to be common sense now that I think about it.